Last night’s season premiere of Real Housewives of New York was, per a friend who watches it, “insane” because they all attended a Halloween party with the theme “come as a famous person who is alive.” On a good day, the standout guest would have been the woman who inexplicably showed up as Amelia Earhart, but it was not a good day, as Luann de Lesseps one-upped that utter misread and came as Diana Ross. Not a wrong choice, per se, but—thanks to a bit of questionable styling—it was also far from right. 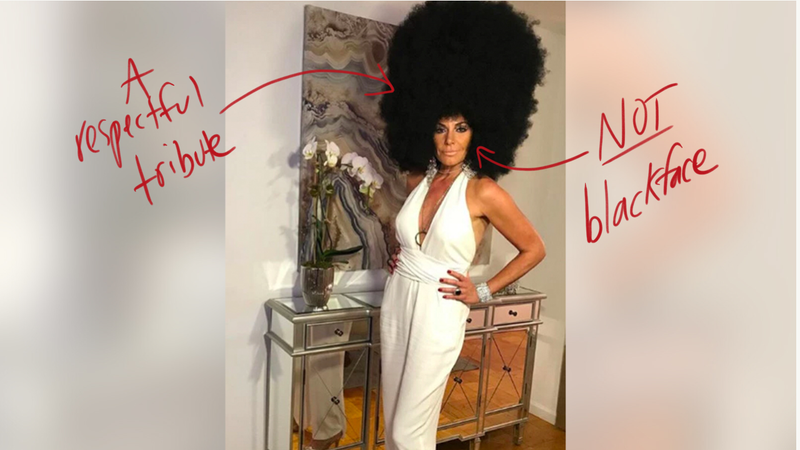 De Lesseps proudly wore an enormous afro wig and makeup that made many people wonder whether she had darkened her skin for the sake of the costume. LUANN: I never meant to hurt anybody’s feelings. I love Diana Ross. I totally respect Diana Ross. It was really kind of a tribute to her. ANDY: The issue is altering the color of your skin. No! I didn’t. I had bronzer on, you know, that I wear normally. So i didn’t add anything... I wouldn’t ever ever dream of doing a blackface. Ever. So, I’m very sorry to everyone out there if I offended anyone. My issue also was Diana Ross very rarely wore an afro. I mean, it was really about the long hair. But that’s another story. I respect Diana Ross. I think she’s fabulous... And it was really my little tribute to her. I’ll echo Andy here. Right. The windshield of Jaime King’s Mercedes was bashed in by a “transient” in LA while her friend and four-year-old son were inside. No one’s hurt, but the photos, published by TMZ, are nightmarish. Lorde sang St. Vincent’s “New York” to surprise guest Jack Antonoff last night during her Melodrama tour and it made me very uncomfortable from way up in the cheap seats.